The Zip and Splash crew traveled up I-40 to Tennessee this morning. 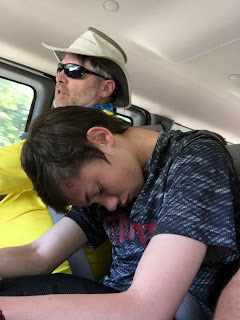 We headed to the Pigeon River along the border between North Carolina and Tennessee, arriving at the NOC outpost for the Pigeon just after 10:00 am and were on the river by 11:00. Happily, we were rejoined by Jordan, the scout who was injured on Tuesday. His ankle had healed enough to allow him to accompany us for the rafting. Joe, Hunter, and Trey prepare to load up on the bus to the put in point. 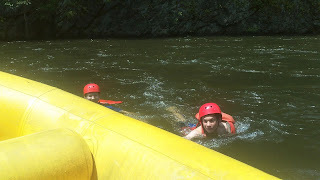 The Pigeon River is much warmer than the Nantahala and the air was warmer today too. We had sun all day, which has not been the case for the last few days. Due to this, most of the crew chose to wear swimsuits rather than bundling up in splash jackets. We put into the river at the Duke Energy power station in North Carolina but were quickly back in Tennessee for the rest of the trip. The Upper Pigeon has Class III and IV rapids with names such as Powerhouse, Lost Guide, Snap Dragon, Veg-o-matic, and Accelerator. This is in contrast to the Nantahala which has one Class III rapid. The crew waits on the ramp to launch the raft. Heading into Accelerator, a Class IV rapid. 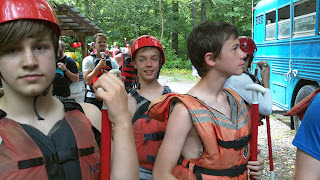 We also had the opportunity to swim alongside the boat as we floated through the calmer parts of the river. 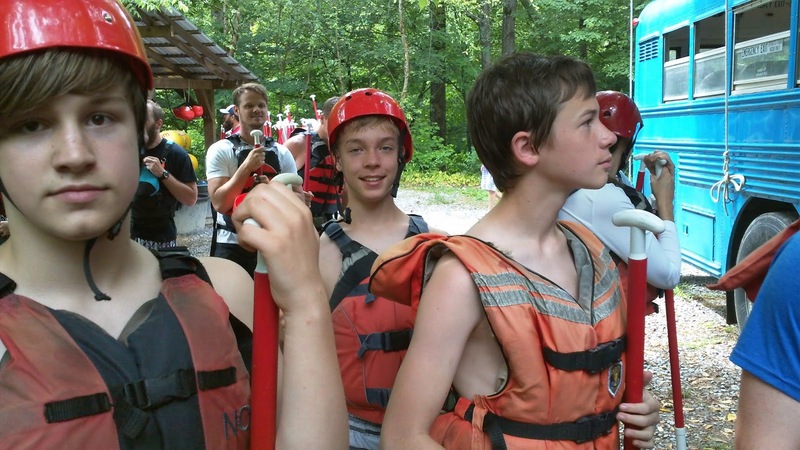 All of the boys bailed out of the boat to swim, leaving the scoutmaster and Mr. Williams alone with the guide. 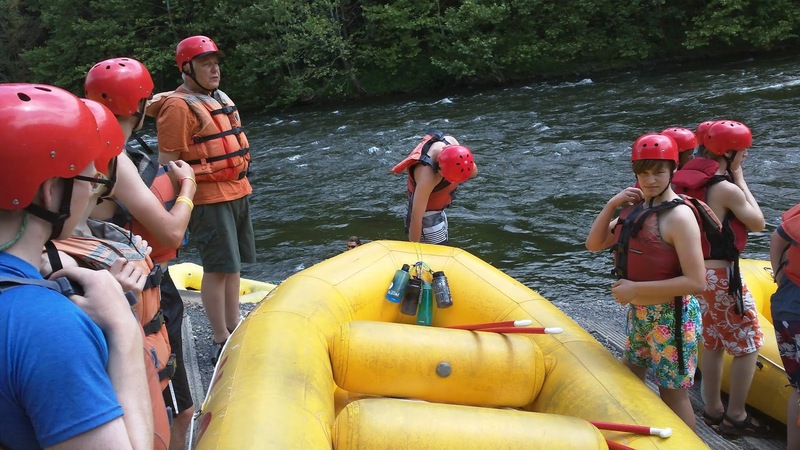 Sooner than we expected, our five mile journey was at an end and we floated up to the back of the NOC outpost to pull the rafts from the water. After we cleaned up and changed into dry clothing, we were enjoying our sandwich lunches in the warm summer sun. Nick and Trey swim along beside the raft. 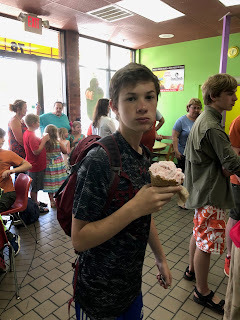 After we finished our lunch we loaded back into the van and returned to Waynesville to a local ice cream shop called Jack the Dipper. They had some fantastic ice cream served in freshly made waffle cones and bowls. We indulged ourselves with more ice cream than we should have but it was surely worth it. Trey is ready to dive into a "small" cone of strawberry. The weight of the ice cream put poor Trey to sleep on the van ride. Following our ice cream stop, we next traveled into the Pisgah National Forest to the Cradle of Forestry in America museum. 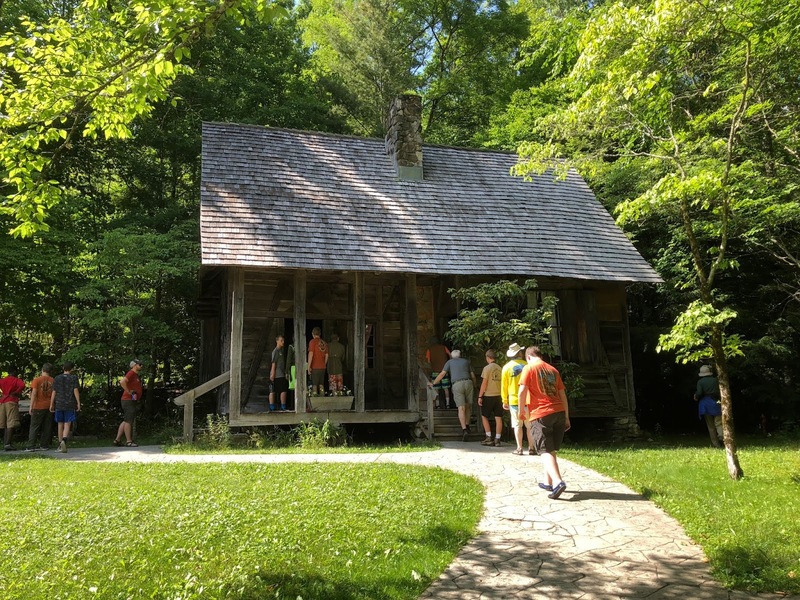 We walked along the Biltmore Campus Trail which wound through the campus of America's first forestry school. Founded by the German forester Carl Schenck in 1898, the school trained many foresters in science-based forest management. The school was sponsored by George Vanderbilt, who needed foresters to manage the lands around his Biltmore estate. The Black Forest Lodge was one of the residences on the forestry campus. 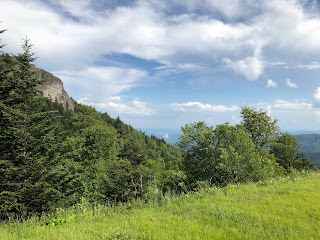 After we closed down the Forestry exhibit, it was back into the van for a trip across the Blue Ridge Parkway on our way back to camp. We passed many spectacular vistas along the way but it was difficult to get the boys to look away from their phones (or book in Joe's case). We made a stop and herded everyone out of the van at one point. This was to enjoy the view as well as to air out the van. We arrived back in camp late but were just in time to catch dinner in the dinning hall. Not everyone ate their full share, however, as the ice cream still weighted heavy on our torsos. The Devil's Courthouse is one of the great views from the Blue Ridge Parkway. 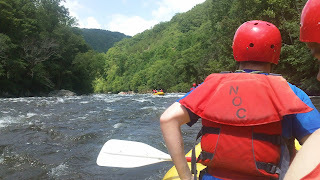 Tomorrow, we will be heading to the French Broad River near Asheville. More photos from today are found here.